Located in the middle of village with relaxing ricefields view, who knows this spot in Ubud can test your adrenaline? The Tunggir is a new tourism spot located in Banjar Kebon, Kedisan Village, Tegallalang. 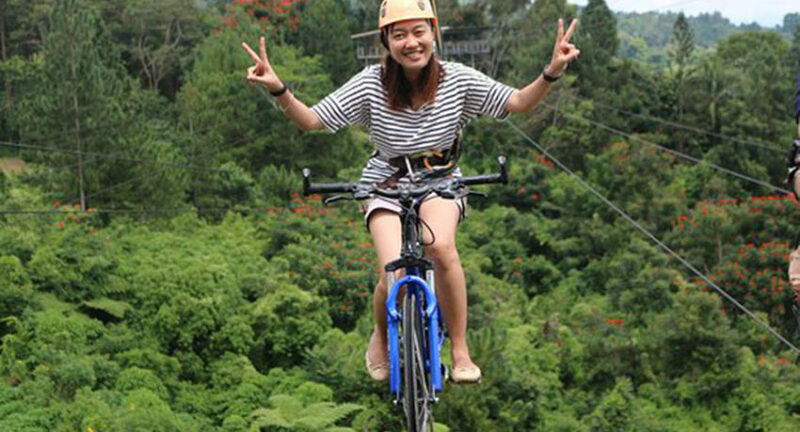 If many other tourist attractions offer swings on the edge of a cliff, The Tunggir offers flying bicycles. After passing through Banjar Tangkup, Kedisan Village, you can meet Banjar Kebon, then continue until meet the beautiful and clean residential area. Until at the north end meet a Village / Puseh Village, Pakraman Kebon, behind the temple, there is a T-junction and you can choose the asphalt road with a width of 5 meters left. From the temple, it is around 1 Km by passing Banjar Tumbakasa, this distance can be reached abot 500 meters on an asphalt road, 250 meters of concrete rebate road that can only be passed by a motorcycle. So those who use cars must park on the edge of the Banjar Tumbakasa road, and you need to walk. Along the way to the rides, you will enjoy the vast expanse of rice fields and farmer activities along the way. Your tired feeling will be paid off and of course will be directed by farmers towards the attraction.